So you’ve picked up your first DSRL along with a kit lens. You’ve been playing with the features, getting to know the camera and the lens. Now you’re starting to think about what to buy next. A lot of advice tells you to invest in lenses, but which one should you start with? If you look into many professional photographer’s bags, you’ll come across the answer—a 50mm prime lens. With all of the choices out there (wide-angle, telephoto, macro), why should you pick up a 50mm and why should it be the second thing you buy? There are several reasons. A 50mm lens comes the closest to capturing what you eye naturally sees, so many beginning photographers find it a good training lens. Keep in mind though, that if you have a crop camera, such as a Nikon D5300 or a Canon 70D, then it is the 35mm lens that is roughly equivalent to 50mm on a full-frame camera (a 50mm lens is still a GREAT choice for a crop). The reason this is a good focal length to train your eye is that there is nothing to get used to. If, without a camera, you need to get closer to something to get a better look at it, you’d do the same with a 50mm lens (or equivalent) mounted on your camera. Likewise, if you need to back up to see something more fully, you’d be doing the same with a 50mm lens. Having a fixed focal length also requires you to spend a little more time composing each shot, which is never a bad thing. When you see a portrait, for instance, that has a softly blurred background behind the subject, this is caused by using a shallow depth of field. This can be achieved by using a low f-stop on the lens. However, your kit lens probably only goes down to about f/3.5, whereas a truly shallow depth of field begins around f/2.8. While you can find lenses out there such as Nikon’s 24-70mm f/2.8, which offers a good focal range and can produce a shallow depth of field, it’s also around $1800. For around $200, you can buy a 50mm f/1.8 lens (or 35mm f/1.8 for crop cameras) that will provide some excellent shallow depth of field. Working with shallow depth of field also requires developing accuracy with focus, which is an added bonus that will benefit all of your photography. A wide-angle lens (less than 35mm) is perfect for landscape photography, but you wouldn’t want to use one for taking portraits as it can cause unwanted distortion. Likewise, telephoto lenses (200-300mm) are excellent choices for photographing wildlife or sporting events, but not so good when shooting street photography where you may not want to draw attention to yourself. A 50mm lens, on the other hand, is excellent at portrait, street, and landscape photography. You can keep this lens on your camera all day and rarely find a situation where you wished you had a different lens. It is also lightweight and fast at focusing, making it an overall pleasurable experience. 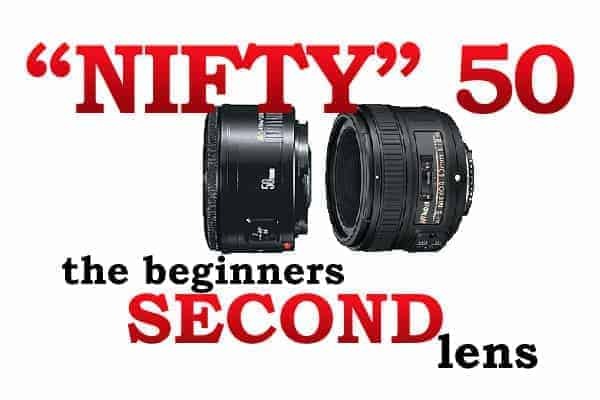 A 50mm lens is often referred to as a “nifty fifty” because it is so versatile and easy to use. It is also an inexpensive investment that promises to improve your photography without weighing down your camera or your bag. It is a lens you can shoot with all day or easily keep tucked away when needed. A 50mm prime (the word photographers use when you are talking about a lens that doesn't change in focal length or “zoom”) is probably the cheapest way to dramatically improve the image quality of your photos – at least compared with the quality from the lens that came with your camera, often called a “kit” lens. It should be the second major investment you make as you start out with your photography. Fair warning though, it will be the gateway to wanting good quality zoom lenses that are far more expensive. Update December 2014: Make sure to check out the comments below for some good questions and answers related to this topic.